Microsoft has entered the US immigration debate with a novel proposal for expanding the number of visas available for foreign techies: have companies pay the government a good chunk of change for an expanded number of them. Redmond's general counsel Brad Smith, speaking on a panel discussing STEM (science, technology, engineering and mathematics) education at the Brookings Institution on Thursday, proposed that companies pay $10,000 for each worker they hire under an expanded STEM-specific H-1B visa program, and $15,000 for every green card issued to foreign tech workers. Currently, the US has a cap of 65,000 "regular" H-1B visas per year, plus an additional 20,000 made available to foreign students who've received a masters or higher degree from a US university. Smith wants to add 20,000 more H-1B visas and 20,000 STEM-specific green cards. Smith's reasoning, understandably, is Microsoft-focused. The company currently has 6,000 unfilled jobs, and he claims that filling them with US-citizen techs is proving to be difficult. "We are creating unfilled jobs," he said, reports InformationWeek. "We have a shortage." What more, Smith said, "We are not alone." Many business and civic honchos have chimed in with arguments that support Smith's "We are not alone" statement. For example, President and CEO of the Consumer Electronics Association Gary Shapiro has been advocating for years for an increase in H-1B visas. In 2011, New York mayor Michael Bloomberg called H-1B visa caps "national suicide." At last year's CES, Cisco chairman and CEO John Chambers suggested that if you're a foreign tech student, you should have an "automatic green card stapled to your diploma." In support of expanded immigration for workers, the now-familiar political mantra of "jobs, jobs, jobs" was chanted in a study released last year by the right-leaning American Enterprise Institute (AEI) and the pro-business Partnership for a New American Economy, which concluded, "The results give clear evidence that both the H-1B and H-2B programs for temporary workers correspond to greater job opportunities for US-born workers." 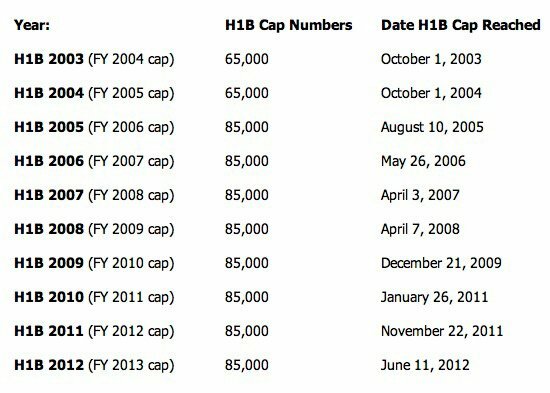 Legislation to expand the H-1B cap has not been successful. Last week, for example, the decidedly business-friendly congressman Darryl Issa (R-CA), in a speech on the House floor in support of Representative Lamar Smith's (R-TX) House Resolution 6429 that sought to reallocate 55,000 visas to foreign STEM students after they graduate, said that high-tech companies in his district "run out of H-1Bs on the day that they're offered." That bill, however, failed to pass a procedural "suspension of the rules" vote by 257 to 158, despite Issa's argument that "America has to be like every high-tech company: you are always open to hire somebody who will make your company grow." It's not known whether H.R. 6429 will make it back onto the House floor, but with an election looming, don't count on it anytime soon. Smith's approach, though, takes a novel tack – and one that might warm the cockles of the heart of any congressperson who's interested not only in creating a better business and hiring climate for tech companies, but also in the other political mantra of this US election season: deficit reduction. "We believe this approach could raise up to $500 million per year – or $5 billion over a decade – that the federal government could use to distribute to states where the STEM education investments are needed," Smith calculates. Immigration at any level – from tech workers to STEM students to farmworkers – is, however, a hot-button issue in the US these days, and one that few lawmakers have the political guts to press. On that same CES panel in which Chambers called for an "automatic green card" for foreign tech students, GE chairman and CEO Jeff Immelt offered the opinion that businesses needed to take the lead in immigration reform. "What ends up happening is that things like immigration become sub-points to a broader narrative of 'We don't trust big institutions. They're taking our jobs. Globalization isn't working'," he said. "Business can no longer sit on the sidelines on any of these points. We gotta fight for our future."